Before their engagement announcement or their first official public appearance together; Before they were even dating, Meghan Markle and Prince Harry were both supporters of the USO and the military community. As the world waits in anticipation of the couple’s royal wedding on May 19, we’ve pulled together our four favorite USO and military support moments featuring the British prince and the “Suits” actress. In December 2014, Meghan Markle, along with country star and USO tour vet Kellie Pickler, USO tour vet and comedian Rob Riggle, “Glee” co-star Dianna Agron, former Chicago Bears linebacker Brian Urlacher and then-Washington Nationals pitcher Doug Fister, went on a USO tour with with then-Chairman of the Joint Chiefs of Staff, Army Gen. Martin E. Dempsey. A first-time USO tour participant, Markle visited five countries – Spain, Italy, Turkey, Afghanistan and England – during her tour and entertained thousands of service members and their families. 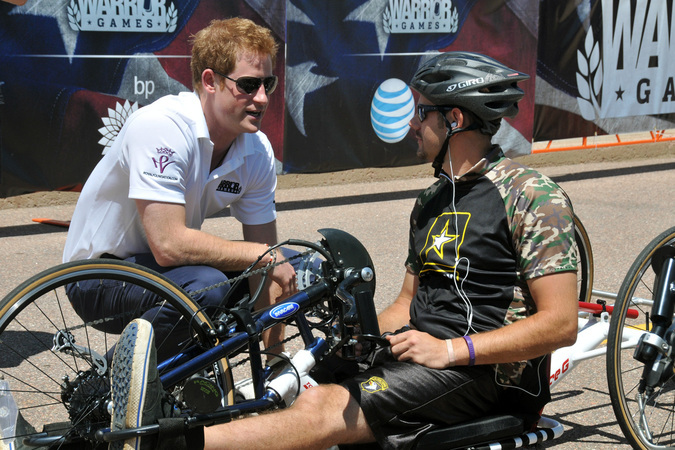 Prince Harry offers words of encouragement to Army veteran Blake McInn before the start of the 2013 Warrior Games recumbent bike cycling competition. 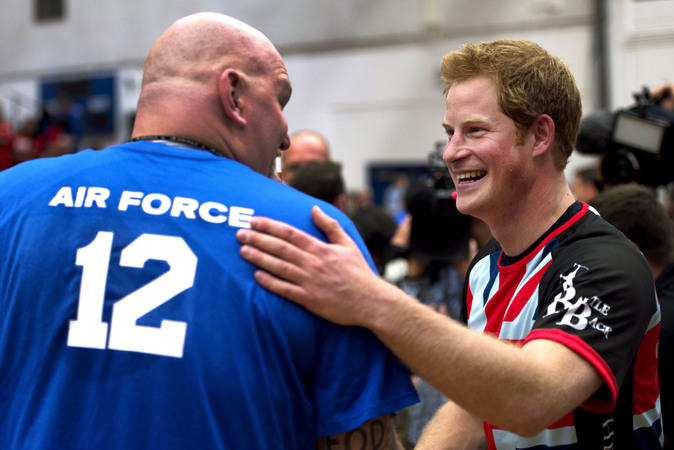 Prince Harry greets an airman during an exhibition volleyball match between U.S. and U.K. wounded warrior volleyball teams during the Warrior Games in 2013. 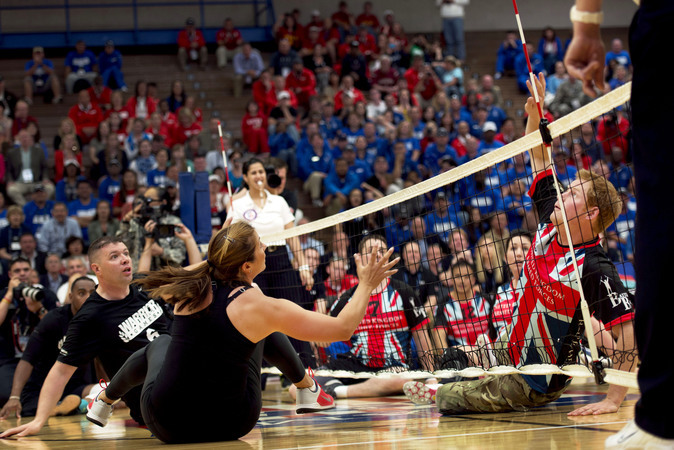 Misty May-Treanor, a three-time Olympic beach volleyball gold medalist, and Prince Harry, play sitting volleyball with wounded warrior athletes during an exhibition match between U.S. and U.K. Warrior Games teams. Britain’s Prince Harry speaks with veteran Randall McMinn and Army Lt. Col. Daniel Dudek at the Warrior Games. 2013 Warrior Games women’s bicycle open bronze medal winner retired Army Sgt. 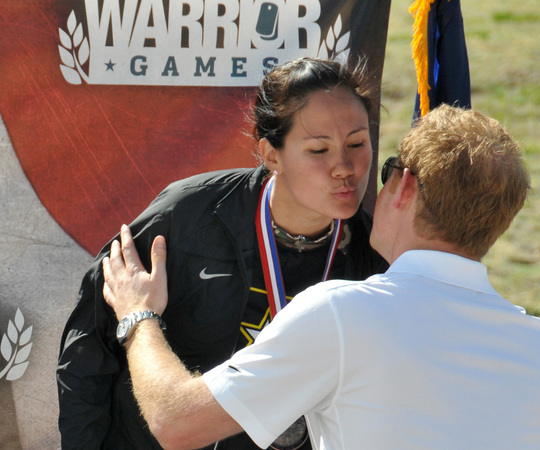 Ashley Crandall receives her medal and a kiss from Prince Harry after the competition. 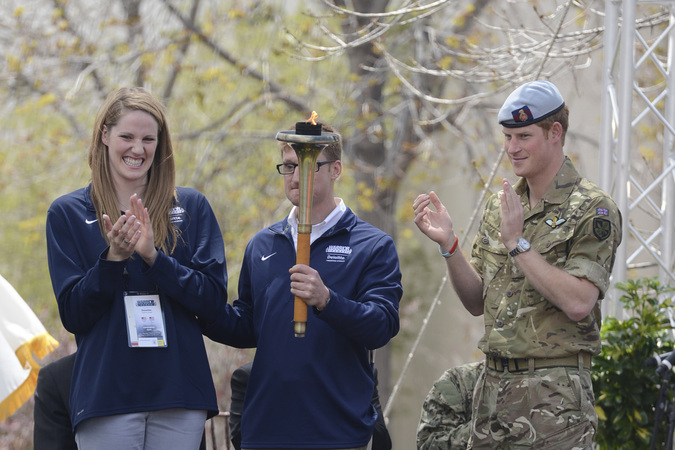 Olympian Missy Franklin, paralympian gold medal winner Navy Lt. Bradley Snyder and Prince Harry prepare to light the official torch to begin the 2013 Warrior Games at the U.S. Olympic Training Center in Colorado Springs, Colorado. In 2013, Prince Harry, then still an active-duty British soldier, attended the Warrior Games in Colorado Springs, Colo. The Games, which were co-sponsored that year by the USO, brought together wounded, ill and injured service members from all U.S. military branches to compete in Paralympic athletic events. 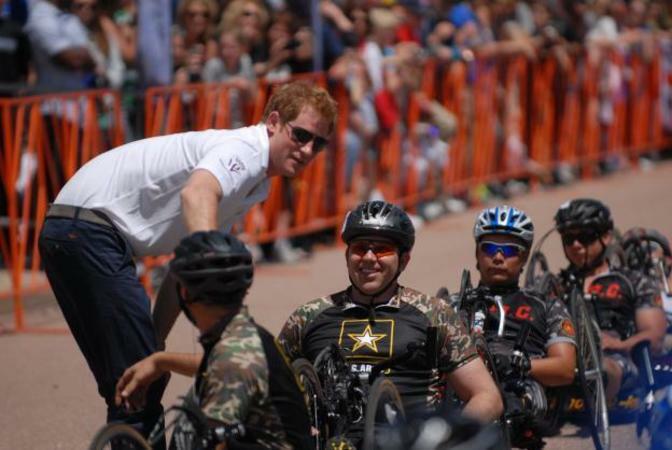 According to the Invictus Games website, Prince Harry was so inspired by his visit to the 2013 Warrior Games that, in 2014, he decided to start a similar competition for international wounded, ill and injured service members called the Invictus Games. To date, Prince Harry is an outspoken advocate of the competition and serves as the Patron of the Invictus Games Foundation. He has attended every Invictus Games since 2014, including the recent 2017 games in Toronto. In 2015, Prince Harry stopped by the USO Warrior and Family Center on Fort Belvoir in Virginia. Prince Harry, along with Joining Forces co-founders Michelle Obama and Dr. Jill Biden, visited the center to see how art and music therapy programs there were helping wounded, ill and injured troops as part of a larger base visit to promote the second Invictus Games. Speaking of the Invictus Games, shortly before their engagement, Prince Harry and Meghan Markle made their first official public appearance as a couple together in October at the 2017 Invictus Games in Toronto. The couple attended both the opening and closing ceremonies together and they were spotted during the games cheering on Great Britain during a wheelchair tennis match.